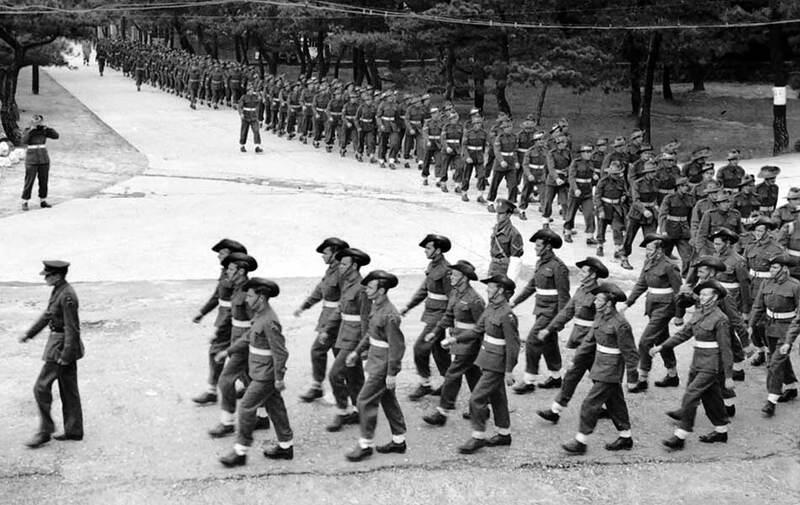 Australian forces of the BCOF (British Commonwealth Occupation Forces) in 1946 in Kure, Japan on parade for Anzac Day. Photo courtesy of Australian Government Dept. of Veteran Affairs. The following is the abstract of the paper presented by a colleague of mine, Walter Hamilton at the Japanese Studies Association of Australia 2011 Biennnial Conference held in Melbourne, Australia in July of 2011. I met him during the Hapa Conference held at UC Berkeley in 2011 where he gave a wonderful presentation of a little studied aspect of the Allied Occupation of Japan–the mixed-race children born to Japanese women and Australian servicemen serving in the Occupation. Australia, New Zealand, India and Britain were part of the BCOF (British Commonwealth Occupation Force) that also participated in the Allied Occupation of Japan, along with Canada and the United States. Although the United States was the dominant and most populous of the Occupying powers in postwar Japan, the Australians and Brits made their mark as part of the “civilizing” powers after the war. Gurkha tribes from Northern India participated in the Occupation. The Australian and New Zealand BCOF personnel were particularly remembered by the Japanese, for being the most outwardly hostile and prejudiced against the local populations. Although most of the Australians stayed away from the locals, due to the similar rule across all of the Occupation soldiers regarding “fraternization” with the locals, the Australians were particularly noted for some of the early brutal rapes that occurred in southern Japan as well as in Kure, where most of the Australian soldiers were stationed. It is interesting to note that in several accounts, the British and Gurkhas sided with African-American soldiers during the race riots between whites and Blacks of the US forces. Also, there were incidents when the Gurkhas sided with the Japanese along with the Americans or Australians during riots where the mistreatment of locals by the Americans, either white, black or brown, were the spark. Many Australians did marry their Japanese girlfriends. Unlike the United States, the governments of Britain and the Netherlands, once the laws were passed, created programs to help the soldiers and their Japanese brides through government services. However, the mixed-race children struggled with societal prejudice against them. Australia refused to relax its laws which denied mixed-race children of Australian/Japanese ancestry of dignity and survival. The United States also refused responsibility for them and left it up to private institutions such as churches. From the end of the war in 1945 through the 1960s, adoption of mixed race children or even to allow funds to be sent to help them, were denied by the Australian government. Needless to say, the patterns of neglect-abuse is repeated in Australia as they were in all of the Allied nations after the war. Note: During the Occupation, most of the Australian BCOF were stationed in the city of Kure (pronounced koo-reh) in the Hiroshima Prefecture. Below is a list of facts from Walter Hamilton’s research, followed by the abstract. Walter Hamilton‘s forthcoming book entitled: Children of the Occupation: Japan’s Untold Story is here. Nearly sixty years have passed since the post-war occupation of Japan. It might be assumed historians will have exhausted all there is to say about its political, economic and social effects. But one unexplored aspect remains vividly alive: the hidden ancestral links that bind Australians, Americans, Britons and others to Japanese blood-relations never known, never met: the unclaimed, mixed-race offspring left in Japan when the troops departed. Their fathers would not or could not acknowledge them: an estimated 10,000 children, including several hundred fathered by Australians. So familiar is the idea of military conquest leading to the birth of “unwanted” children outside marriage – across racial, class and cultural divides – they tend to be dismissed as a natural corollary of war. Their appearance in occupied Japan came as no surprise. The “Madame Butterfly” tradition provided a high-toned model of Western men exploiting Japanese women. As if their biological inevitability made them what they were, the children attracted scant attention from Western writers, who acquiesced in facile assumptions about their fate. Surely they were disowned by their fathers, lamented by their mothers and thrust to the lower depths of society. The eminent American historian John Dower has called them “one of the sad, unspoken stories” of the occupation. Japanese historical and fictional treatments of the issue also suffer from a determination to link the children exclusively to prostitution, moral collapse and national humiliation.